This is a 375ml can of a craft beer that is 4.5% ABV and about 135 calories a serve size, this is about 1.3 standard drinks in New Zealand. This lightly soured Gose (pronouned ‘GOH-zuh’) is brewed with a handsome dose of rye malt for dryness and spice, and Margaret River seawater for tender saltiness. Finally, it’s turned into a citrusy gin sling with a dose of Broadside from The West Winds Gin. It’ll take you straight to La La Land. 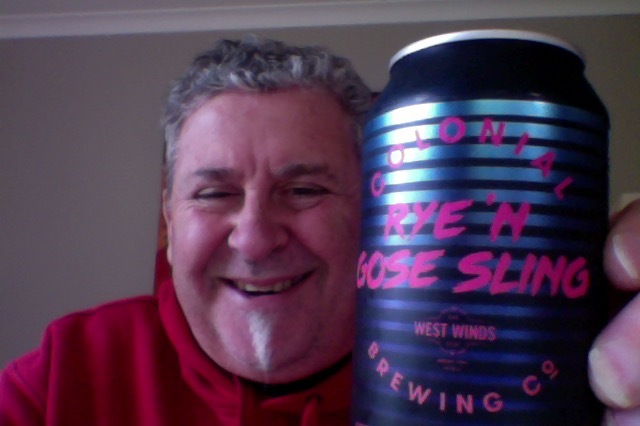 A lightly soured Gose with rye malt, Margaret River seawater and a dosing of West Winds Broadside gin. Finished with a few US hops, if Gin Sling was a beer, it’d be this. Brewed for GABS 2017. So a Salty, Gin, Rye sour beer. ‘mkay…. Big mouth can, but I’m going to pour it into a glass, because you know, fancy, and all that. Like a bullet crack opening that, took me by surprise. If anything that’s a malty aroma. Then the aroma wafts over and it’s intriguing but then I lean t take a sniff and it’s gone again, oddly odd, I still get that light hoppy note though, and a mustiness. The lovely white head faded all to quickly, it looked magnificent whilst it lasted. Aroma isn’t something I could pin down, this looked great with a lovely head but it went too quickly. Sourness is just right, but it’s not a complex beer that offers other things to entertain the palate. For all that though this is quite nice drinking, that sour/saltiness is at the low end of the scale, and that means you get to tickle your tongue and be refreshed rather than gasping and squinting with shock, but not awe. This is also ‘fruiter’ in some ways that other sours beers of this type, but sadly I didn’t get the Gin kick, but I did get the hoppy things. Not a bad refreshing beer and although rather middle of the road, this is a nice choice to lead the pack. The pdubyah-o-meter rates this as 7 of its things from the thing. It’s ok but it’s not something that you’d rave over, it’s just a refreshing beer that promises a lot and talks a better game than delivering in the tastes that it promises. I enjoyed it though it’s easy to drink and enjoy. Am I enjoying it? I am, it’s nice and refreshing. Would I have another? One would be enough. Would I share with a friend on a porch and set the world to rights? Not really, apart from a comedy name there’s not a lot else to talk about. 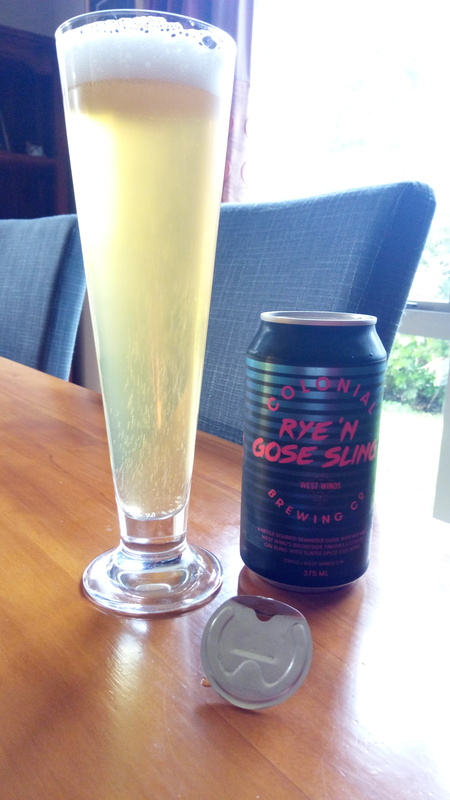 This entry was posted on July 22, 2017 by Philip Walter in Beer, Beer of Australia, Beer Review, Brewed By, Colonial Brewing Company, Craft Beer, Critic, Grodziskie/Gose/Lichtenhainer and tagged Colonial Brewing Company, Colonial Brewing Company Rye 'N Gose Sling, craft beer, craft beer review, GABS 6 pack, Rye 'N Gose Sling.